I agree Raimo. I don’t get all the fuss about Twitter. Jaiku the real breakthrough in this field. I’ve wrote an article (dutch) about Jaiku last year. Jaiku picks up where people that put @home, @work, @school in their IM nickname left off. From my point of view microblogging is just a new web20-term. 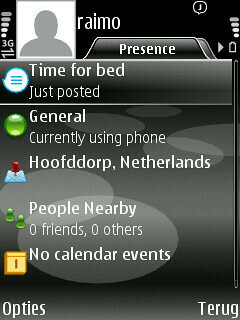 Twitter starts to function as a router(or so).. with alot of development on the edges of the service. When I look at the diagram that I think that the big circle for microblogging is a bit misleading. 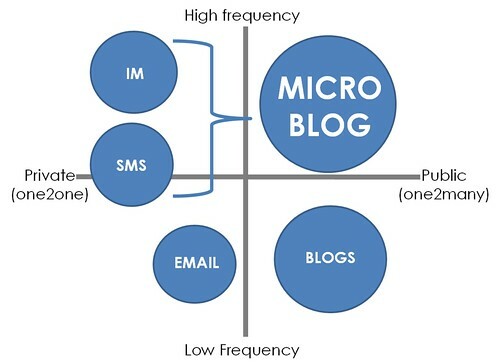 What is the difference between IRC / online chatrooms and “microblogs” in the diagram? From my point of view a difference between IRC and MBlogs is the social aspect. In IRC the context is defined by the room you’re in, with MBlogs the context is your social network.